William Harrison was the 9th President of the United States who served in office from March 4, 1841 to April 4, 1841. What was the life of William Harrison like? The short biography of President William Harrison covers important information and facts about his early life, his family, career and the famous events and achievements of his political life. Our short biography of William Harrison provides an interesting and easy way to learn about the life of the President. The following important facts provide a fast overview of important facts about President William Harrison. Facts and Info: William Harrison was the 9th president of America and is remembered as the first President to die in office serving just for 32 days. For additional info refer to 20 Facts about William Harrison. Facts and Info: William Henry Harrison was born on February 9, 1773 in Charles City County, Virginia. He came from a prominent political family who lived on the Berkeley Plantation, the traditional home of the Harrison family. He was the last president born as a British subject before American Independence. His grandson was President Benjamin Harrison. William Henry Harrison died on April 4, 1841 in Washington D.C. whilst still in office. Facts and Info: The career of William Harrison included the roles of Military Officer, Politician and Statesman. He was well educated and attended the University of Pennsylvania. He became the 9th President of America in 1841 and served just for 32 days. Facts and Info: William Harrison married Anna Tuthill Symmes. She was the daughter of Judge John Cleves Symmes, a former representative to the Congress of the Confederation. William Harrison and his wife Anna had 10 children, 9 of whom lived into adulthood. Facts and Info: William Harrison belonged to the Whig Political Party. The Whig political party operated from the early 1830s to the mid-1850s in opposition to the Democratic Party and favored a program of modernization and economic protectionism. He was 68 years old when he was inaugurated as the 9th president. Inauguration is a President's swearing-in ceremony. William Harrison died on his 32nd day in office. John Tyler stood as Vice President. For additional facts refer to his Presidential Cabinet members. Short Biography of William Harrison: What he was like! Facts and Info: William Harrison was 5 feet 8 inches in height and had a slim build. He had thin brown hair that turned grey as he aged, closely set eyes, thin lips, a strong jaw and a fair complexion. He was described as a plain speaking, good humoured and unpretentious man. Harrison was a military hero and was given the nickname of "Old Tippecanoe" in reference to Harrison's victory at the 1811 Battle of Tippecanoe against the Shawnee and a large Native Indian Confederacy. Facts and Info: During his lifetime he played a key role in important events of the era. He was appointed Governor of the Indian Territories and defeated a force of British and Indians including Tecumseh at the Battle of the Thames. William Harrison began the War of 1812 as the important General of the Kentucky militia. Facts and Info: During his life William Harrison suffered from various health problems including pneumonia, pleurisy, jaundice and septicaemia. This was not unusual for this time period as medical knowledge was in its infancy. What is more surprising is that he survived these illnesses and lived to the age of 68 years old. 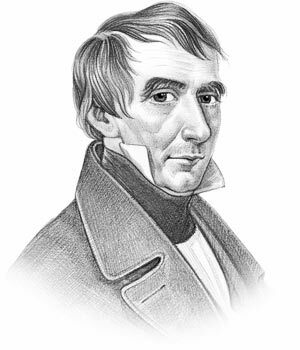 Facts and Info: William Harrison gave his inaugural address in freezing snow without adequate clothing that led to his death from pleurisy & pneumonia. He died within a month on April 4, 1841 in Washington D.C. The short biography of William Harrison provides a fast overview of the key facts and events about his life and the accomplishments of his presidential term in office. The following William Harrison video enables you to sit back and listen to the history of his personal and political life - a useful educational resource for kids, children and schools learning about the life of President William Harrison.